The more you know, the more you care. The Family Effect supports programs that are designed around the latest science in family treatment for addiction. This gives our families the best shot at transformation. It's also the best way for our donors to make a real difference in their community. Every once in a while, we come across some notable reading that relates directly to our mission. If we think you might be interested, we'll post it here. If you see something you like - or don't like - let us know. We love hearing from you. Think that brain of yours came pre-programmed? Think again. Our brains start wiring themselves up just after we're born, and the process continues into adulthood. But the vast majority of our brain's "architecture" is formed before we turn age six. If our experiences as a young child are good, the brain tends to wire itself up in healthy ways that anticipate a safe, healthy adulthood. But if our experiences as a young child include neglect or abuse, the brain's ability to "wire up" normally- or even completely- is often lost. This reality is central to our mission at The Family Effect. More than 80% of our community's neglected and abused kids are living with addiction in their family home. 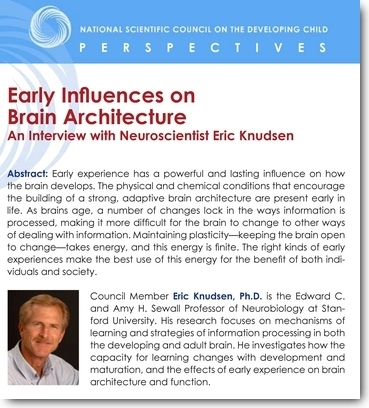 Dr. Eric Knudsen is a professor of Neurobiology at Stanford University, and a member of the National Scientific Council on the Developing Child. He's a ringer on this subject. Take just a minute to read this quick interview, and you'll have a good understanding of how brain science plays a central role in our community's mission to save children from harm. We've all heard the concept of a child being "scarred for life." Did you know there is some very real brain science behind this term? Children who have been exposed to extreme neglect or long-term stress in their early years show critical differences in brain scans. For these children, overall brain activity is suppressed, with some functions being disabled altogether. This is important to our mission for two reasons. First, children who grow up with addiction in the home are often neglected...sometimes severely. Second, neglected children with impaired brain development typically grow up to be adults who can't function well in society, and that means they need public entitlements to get by. The smart thing to do for our nation, and the moral thing to do for our community's children, is to attack this problem at its root. That's what The Family Effect is all about. 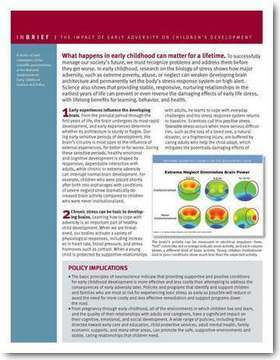 Take a quick look at this two-page summary from Harvard University's Center on the Developing Child. It's enlightening, and may give you a new perspective on our mission.